Las Vegas is a city in the American state of Nevada. There were 640,932 people living in the city in 2015, and more than 2,000,000 people living in the metropolitan area. It is the largest city in Nevada. 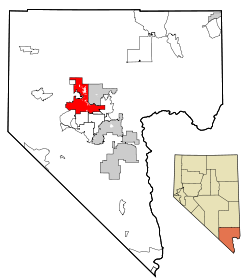 Las Vegas is also the county seat of Clark County. The current mayor is Carolyn Goodman, who has served as mayor since 2011. Native Americans, the Paiute tribe, first lived there. It was called Las Vegas by the Spanish. The name means The Meadows in the Spanish language. It had a lot of these in 1854. The city is known for its dry weather, as is the rest of southern Nevada. It is surrounded by deserts. The US Army built Fort Baker there in 1864. Las Vegas has springs so people used to stop there for water when they were going to Los Angeles or other places in California. In 1905, 110 acres owned by William A. Clark, on which he built a railroad to Southern California were auctioned and Las Vegas was founded as a railroad town. Las Vegas officially became a city in 1911. This page was last changed on 20 February 2019, at 10:32.